Acquired immune deficiency syndrome or acquired immunodeficiency syndrome (AIDS) is a disease of the human immune systemcaused by the human immunodeficiency virus (HIV). The illness interferes with the immune system making people with AIDS much more likely to get infections, including opportunistic infections and tumors that do not affect people with working immune systems. This susceptibility gets worse as the disease continues. To date around 65 million people have been infected with HIV and AIDS has killed more than 25 million people since it was first recognized in 1981. The vast majority of the 38.6 million people living with HIV in 2005 are unaware of their status. In 2005 AIDS claimed the lives of 2.8 million people and over 4 million people were newly infected with the virus. At around 17.3 million, women make up almost half of the total number of people living with the virus. Sub-Saharan remains the most affected region in the world. 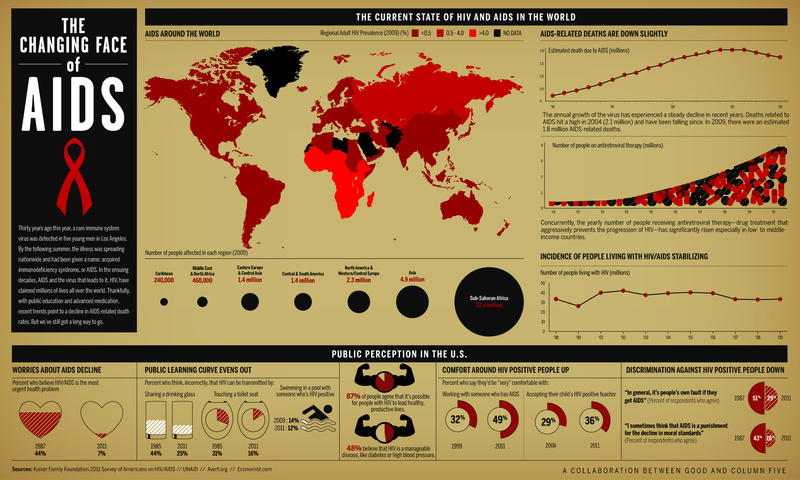 Two-thirds of all people living with HIV, 24.5 million, are in sub-Saharan Africa. Declines in HIV prevalence have been noted in some countries, including Kenya, Zimbabwe, urban parts of Haiti and Burkina Faso and four Indian states including Tamil Nadu. There are more new HIV infections every year than AIDS-related deaths and as more people become infected with HIV, more people will die of AIDS-related illnesses. Worldwide, fewer than one person in five at risk of becoming infected with HIV has access to basic prevention services. Only one person in eight who want to be tested is currently able to do so. Each day, 1500 children worldwide become infected with HIV, the vast majority of them newborns.